It was in 1878 that George Hamilton's saltery at Klawock on Prince of Wales Island in Southeast Alaska was turned into the North Pacific Trading and Packing Co. 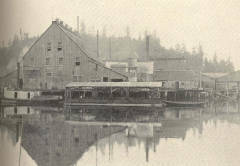 It was Alaska's first salmon cannery. Fred Hamilton is the 96 year old grandson of George Hamilton, the founder of this cannery. This summer, I got to speak with Fred and a host of others from Prince of Wales Island and elsewhere about the beginning of Alaska's commercial salmon industry. In Southeast Alaska, the Tlingit had developed a sophisticated fishery management structure and conservation-minded fishing gear so that they could adequately feed their communities while assuring the conservation of the salmon runs. The Russians never profited from Alaska's salmon resources, but the United States knew about the potential inherent within Alaska's waters when the Treaty of Cession was signed in 1867. Within a decade, American entrepreneurs opened salmon salteries around Southeast Alaska, relying of Tlingit and Haida fishermen and management practices. This changed with the industrialization of the salmon fishery. In this episode, you will hear the words of Senator Charles Sumner and a first hand account of when Chinese cannery workers arrived in Southeast Alaska, learn about Tlingit fishing weirs and stream ownership from Dr. Stephen Langdon and Dr. Dennis Demmert, and listen to Fred Hamilton's memories of the Prince of Wales Island salmon industry that date back to the 1930s. All of this is packed in a can of Klawack Brand salmon. Special thanks to Kathy Peavey, Karen Hofstad, Fred Hamilton, Dennis Demmert, Steve Langdon, the Alaska State Museum, the Alaska State Office of History and Archaeology, the Alaska Historical Society, and the Alaska Historical Commission for making this episode possible. If you like this episode, you might also enjoy Canned at Karluk and Filipinos in Larsen Bay, 1915.